Our Teacup Puppies are 100% healthy with excellent temperaments. 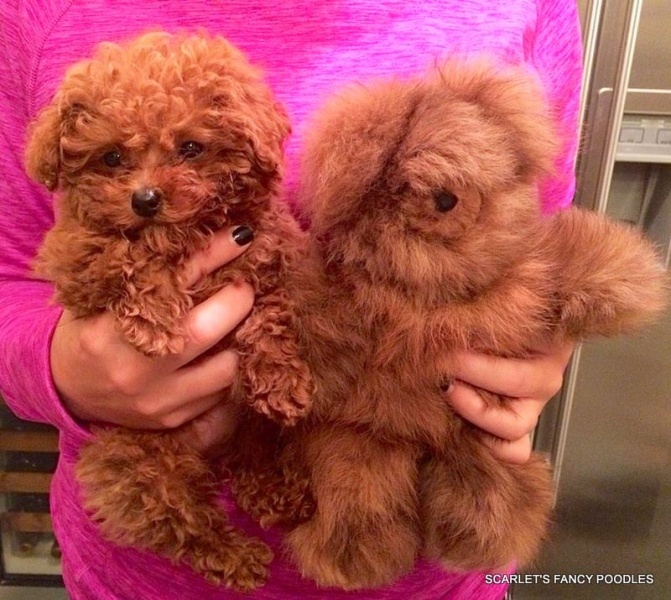 They are beautiful and adorable, they do not look like real dogs. Their adult weight will be under 4 lbs at maturity. Because of their small size they are not robust enough to live in a household with children. It is of utmost importance that these Teacup puppies live with a family that have pets that are under the weight of 5 lbs, because of the possibility of injury. Or if you have a larger pet, be aware that bigger pets cannot play with the Teacups. Teacups are not big enough to jump off of your bed or go upstairs. These dogs are hearty for their size, but because they are so small, injury is the biggest danger a teacup faces. We own Thumbelina here at Scarlet’s Fancy Poodles, she is 2 lbs 2 oz and is a fine family member, but we do keep her away from possible danger.